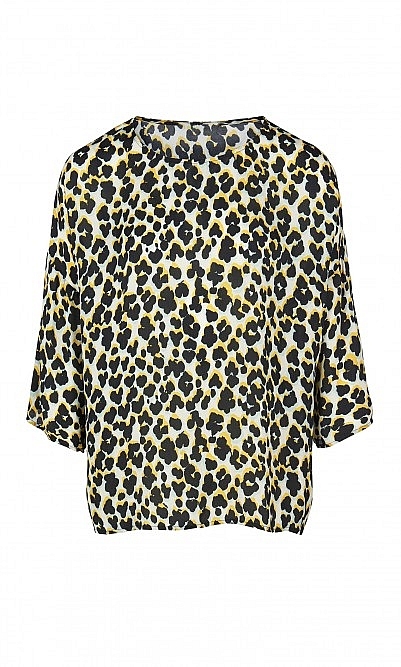 Colour-pop leopard print top with scooped hem and elbow-length sleeves. Wide, fluid cut. L60cm. Viscose. A very nice blouse, I am usually not keen on Leopard prints but this suited me. It's got a dash of contrasting yellow colour which updates it beautifully and makes it different from a regular leopard print. The shape is perfect for me. It sits well, the fabric is soft. I haven't washed it yet, can't comment on that yet but otherwise a perfect little piece for my wardrobe.